With another Christmas just around the corner, it’s the time of year that we stop and reflect on just how fast time seems to fly by, and how quickly our little ones grow and change – it seems that in an instant they go from teeny newborns, to toddlers to school age children, and all of a sudden they’re grown up…. A beautiful photograph can make time stop, capture the moments in between and capture changing personalities over time. 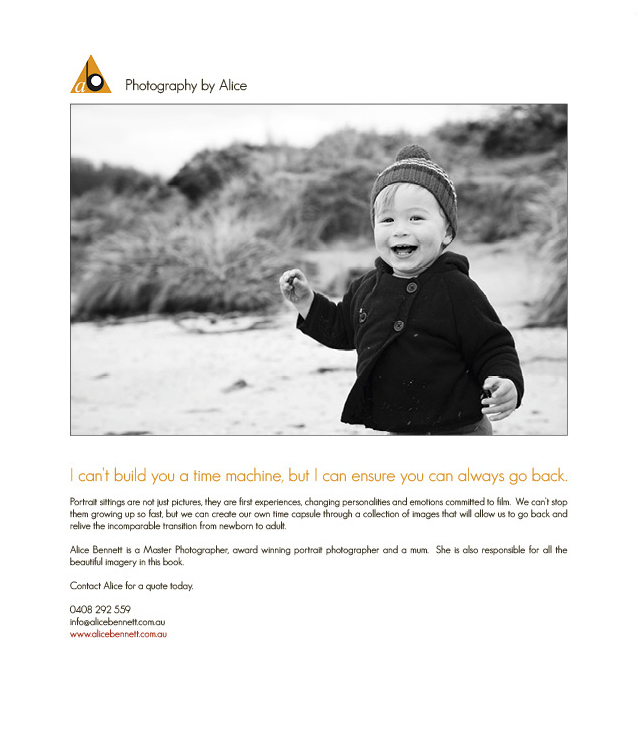 Master photographer Alice Bennett is an award-winning portrait photographer, best-selling author, and a mum. She understands how important it is to capture these special moments and a photography session with Alice will provide you with images to treasure and remember always. Alice is responsible for the all of the beautiful photography in the Bream Creek Farmers Market Cook Book and her love and passion for our region is reflected in her photographs. Alice has also photographed and published best-selling books, Country Houses of Tasmania and Living in History. The BCFM Committee warmly thanks Alice for her work in photographing the stunning images for the Cook Book. The photographs are a wonderful reflection of the people, produce and environment that our community has to offer and Alice has captured these to perfection. Alice’s recipe for Blueberry and Almond cake is perfect for afternoon tea – or serve it with thick cream as a dessert. It contains no flour so is suitable for those on a gluten free diet. Try substituting fresh, local raspberries for the blueberries while they are in season. Preheat oven to 160°C. Grease a 27cm springform cake tin. Heat a frying pan over medium heat, add the ground almonds and stir until they become fragrant and slightly golden in colour. Put aside to cool. Cream the butter and sugar in a mixing bowl until pale. Add the eggs one at a time, beating after each addition and then add the vanilla. Add the almond meal and essence and mix well. Pour into prepared tin and arrange the blueberries on top. Bake for 40 minutes or until a skewer inserted into the cake comes out clean. Leave in the tin to cool. Serve at room temperature with a dollop of thick cream. If fresh blueberries are out of season, frozen berries can be substituted. For a delicious winter cake, substitute freshly picked blackberries. In summer, raspberries are a wonderful addition.